In the 1960s, the governments of Colombia, Peru, and Bolivia launched agricultural settlement programs in each country’s vast Amazonian frontier lowlands. Two decades later, these exact same zones had transformed into the centers of the illicit cocaine boom of the Americas. Drawing on concepts from both history and anthropology, The Origins of Cocaine explores how three countries with divergent different mid-century political trajectories ended up with parallel outcomes in illicit frontier economies and cocalero cultures. Bringing together transnational, national, and local analyses, the volume provides an in-depth examination of the deep origins of drug economics in the Americas. 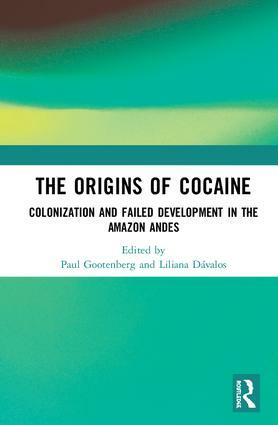 As the first substantial study on the shift from agrarian colonization to narcotization, The Origins of Cocaine will appeal to scholars and postgraduate students of Latin American history, anthropology, globalization, development and environmental studies. Paul Gootenberg is SUNY-Distinguished Professor of History and Sociology at Stony Brook University, USA, where he is also currently Chair of the History Department. He is a former chair of the Drugs, Security, and Democracy Program (DSD) of the Social Science Research Council and Open Society Foundations. Liliana M. Dávalos is Associate Professor of Conservation Biology at Stony Brook University, USA. She has advised the United Nations Office of Drug and Crime on deforestation since 2007 and is coauthor of the 2016 World Drug Report.